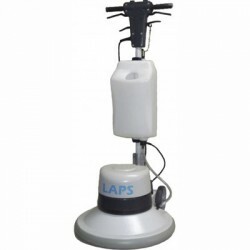 The LAPS PROFESIONAL R-17-1800 rotary floor machine 430 mm is a cleaning machine suitable for the most demanding tasks, thanks to its two powerful motors of 1000 and 1800 w with planetary systems. It has an adjustable reinforced steel arm that stands bumps and corrosion caused by crystallisers and strippers. 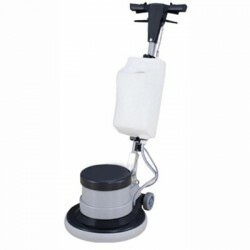 This rotary floor machine 430 mm also has a double safety system to avoid unnecessary risks for professional hygiene workers. 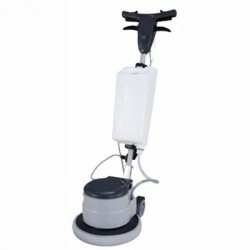 ForÂ its small size, it has an adequate balance between weight, diameter, and rpm. Its cover is manufactured in tempered steel,which helps balance the weight of the motor to ensure excellent behaviour at all times. It also has optional 10-kilo weights and a one year warranty against manufacturing defects. Diameter: 17 - 43 cm.